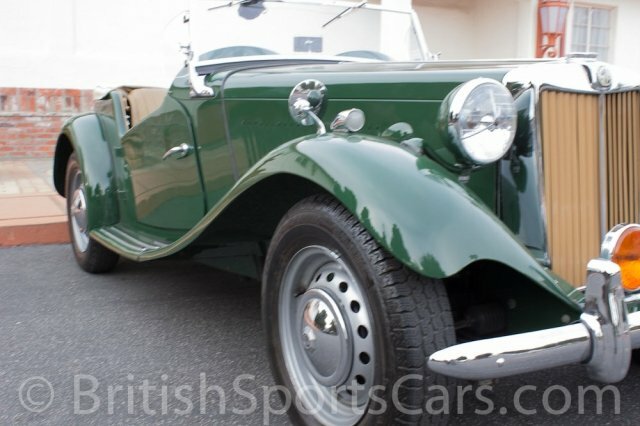 You are looking at an amazingly well-restored MG TD MK II. This car has been subject to a no-expense-spared restoration in which the whole car was restored from the ground up. The wood in the body has all been replaced, and the doors open and close perfectly. We have all of the bills from this restoration, which was done between 1990 and 1995. This is an older restoration that has only been driven 592 miles since completion. The car still drives and shows as if it was just restored. The paint and body is very nice. The leather interior is also near perfect. This car has been part of a large MG collection for many years, and it is now time to move it on to a new owner. The engine number is XPAG 8080 which is matching and correct for the car. The MKII was a competition version of the TD, of which 1,710 were produced. It was updated with bigger valves, bigger carburetors, dual fuel pumps, and an extra set of Andrex friction shocks. The car has slightly more power than a stock TD, but drives and handles much better with the additional shocks. Please feel free to contact us with any questions..